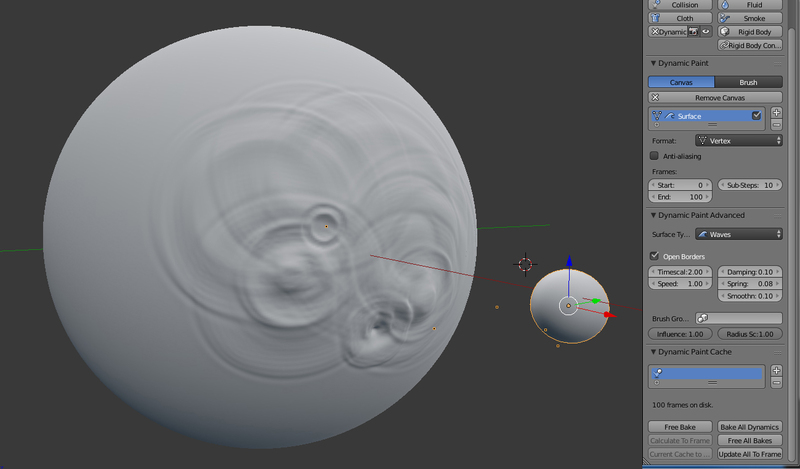 I am working with the dynamic paint waves function to simulate ripples along the surface of a sphere. I was wondering if it is possible to bake the deformation into a black and white displacement map texture so that I could use that texture with a displacement modifier instead of dynamic paint. Also, another question I have is how do I bake(point cache) the animation on file? When I press bake, it doesn't let me choose where I want to save the files and the bake doesn't even play in real time. I come from 3ds max and the flex modifier is similar to this. I am able to use a point cache modifier to save the animation to a sequence of files so that I can preview the simulation in real time. It also allows me to save an instance of the simulation so that I don't need to re-simulate every time. Is there a way to point cache the dynamic paint wave simulation onto file? Browse other questions tagged texture-baking baking displacement dynamic-paint cache or ask your own question. Best way to bake rigid body physics?